Beroid Comb Jellies are the Ctenophores that belong to the genus Beroe. They are basically a sack with a gigantic mouth at one end and, unlike other Comb Jellies, they have no tentacles for capturing prey. Why? Because they don't need them of course! Beroids eat almost nothing but other Comb Jellies, which is pretty rude. Some of them even focus their attentions on particular species of Comb Jellies, which is ruder still. They have the same rows of cilia used for swimming as other Comb Jellies do, but they also have other more unique ones. too. Lining that gigantic mouth of theirs, rows of hair-like cilia are fused together to create what one could well call "teeth". 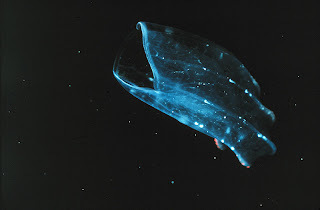 This means that the Beroid can take bites out of Comb Jellies that are too big to swallow whole. This is good because while some Beroids might be 15 cm long, others can be just 3 cm. When not being fed, that abyssal mouth can be shut. Furthermore, some Beroids have sticky lips, meaning that it can be tightly closed to offer a more streamlined shape when giving chase to prey. You need every advantage you can get when you're a ravenous mouth and almost nothing else whatsoever! Hahaha! I'm basically addicted to chocolate so I know exactly what you mean! They eat nothing but each other? Wouldn't that make it a little hard to reproduce? Sorry, they eat almost nothing but OTHER species of Comb Jelly. I don't know how much actual cannibalism they indulge in. There are several species of Beroid Comb Jellies, and even more other Comb Jellies that aren't Beroids. So they do have a bit of choice! I hope that makes it clear! It's so hard to imagine a jelly doing anything other than just sit there and be a jelly. Even when it's sparkling and glowing, it looks like it has no real idea how it got there or how to swim away. The idea of one BITING something just seems wrong somehow. I know exactly what you mean, Crunchy. Not only can they not hold an idea in their head, they simply have no head! It's amazing stuff, but there you go. I love comb jellies! They're like living Christmas tree ornaments... that swallow other Christmas tree ornaments. Hahaha! I'll think about that next time I get the decorations out!